Click Click is a British electro-industrial music band. 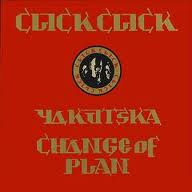 Click Click formed in Sheffield, England in 1982 by Adrian Smith, and Derek E. Smith, after the end of their previous rock project "Those Nervous Surgeons" (which formed in 1976 with bassist Tim Wilson). When Wilson bought their first synthesizer, (an EDP Wasp), the direction of the group changed so dramatically, they renamed themselves. In 1982, the group acquired guitarist Richard Camp from another band and thus the first experimental synth-rock incarnation of Click Click was born. They cut their first single later that year, but Camp departed over creative issues and formed a blues band. Influenced by artists such as Brian Eno, Cabaret Voltaire, The Residents and Frank Zappa, and of course Blade Runner, Clive Barker and "mind-expanding" substances, Click Click continued on with other revolving members down a more electronic path until their eventual break up around 1990. Other members included guitarist Jon Morris, who was replaced by Graham Stronach in 1987, and Pete Hosier who remained with the group until the end. After a 7 year hiatus, Adrian and Derek reformed briefly in 1997 to record Shadowblack on the OffBeat label. The album was more EBM than their earlier work and almost completely instrumental. It was greeted with overall positive reviews within the underground music scene. Due to the member's volatile relationship however, the band split again in 1998, with no current plans for another reunion. A Click Click vinyl release was issued on NYC-based Sonic Groove Records in 2004, but it is most like that only Adrian was involved, but that is still unclear. Throughout the 2000s, Adrian has been involved with Paperhouse, a darker ambient soundtrack project. Nothing has been released publicly, aside from a few odd compilation appearances, but at least 4 CD-R releases are known to exist: Bug Sun, Sappho, Frey, and Sammlung. In addition, three Click Click CD-Rs surfaced offering odd unreleased and remixed material: Lung Function, Crushed, and Behind Dark Glasses. The summer of 2008 brought the news that Click Click's back catalogue would be available again, this time via various download platforms including iTunes. The material will come in remastered versions and will also include the early catalogue. Lung Function, a compilation of remastered singles, was released on iTunes, Amazon digital service and eMusic in 2008.